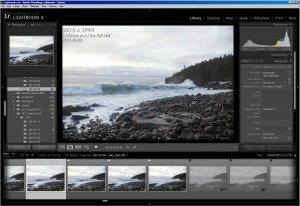 Learn how to get the most out of your images with Adobe Lightroom. This course will start on Friday afternoon with an evening shoot in Acadia National Park. We have the option to head out the next morning for sunrise before we dive into Lightroom’s powerful develop module. You will become familiar with all the basic tools available to optimize your raw file and be ready to publish. Participants must bring their own laptop with Lightroom 5 or CC installed. Our classroom space features six individual monitors, mice, and keyboards for your convenience. Our guesthouse is available for your use from Friday noon through Sunday afternoon. 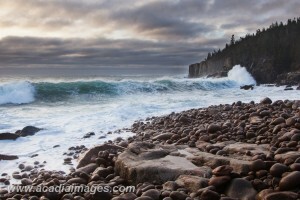 March storm brings in big waves to the cove north of Otter Cliffs, Acadia National Park.